In times of war, awful things do happen—though it is not always clear who commits the violent act. The Massacre of Jane McCrea. Courtesy of the Old Fort House Museum. None Shall Make Them Afraid (the story of the White Feather) by James Doyle Penrose. As Burgoyne advanced south on Fort Edward, the Indians in his company were stirring up trouble, stealing horses and food from settlers. And stories of Indian atrocities spread like wildfire—whether true or not. The Allen family massacre, as described in the previous chapter, was brutal, yet it did not get nearly the same attention as the legendary story of the murder of Jane McCrea. Jane was a young women caught between loyalties. Her brother was a Rebel, her fiancé a Loyalist. Jane eventually decided to join her fiancé, who was traveling with Burgoyne’s army, but she died while crossing enemy lines. 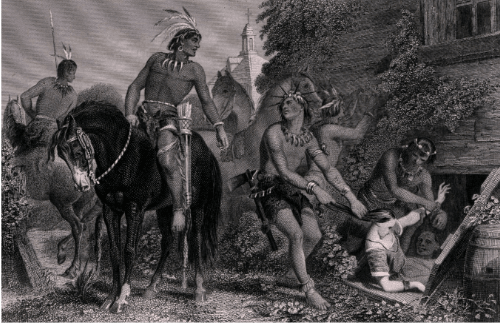 The most common telling of the story is that two groups of Indians fought over who would get the honor and reward for returning the young girl to her betrothed and she was killed during the exchange. Another telling suggests that the Indians were really Rebels in disguise. The circumstances of her death have been embellished over the years, but the viral-like coverage of the massacre helped perpetuate fear of Burgoyne’s Indian allies. The result of the Jane McCrea murder—and other unsubstantiated stories of Indian brutality—was the flight of the local population. Some fled from the area, finding shelter among relatives and friends in the distant New England colonies, while others poured into Burgoyne’s camp—living in crowded, often unsanitary conditions. Either choice forced farmers to abandon their crops at the height of harvest. Not all stories about the Indians were so brutal. One local legend tells the story of a group of Quakers who lived in the vicinity of Easton, New York. 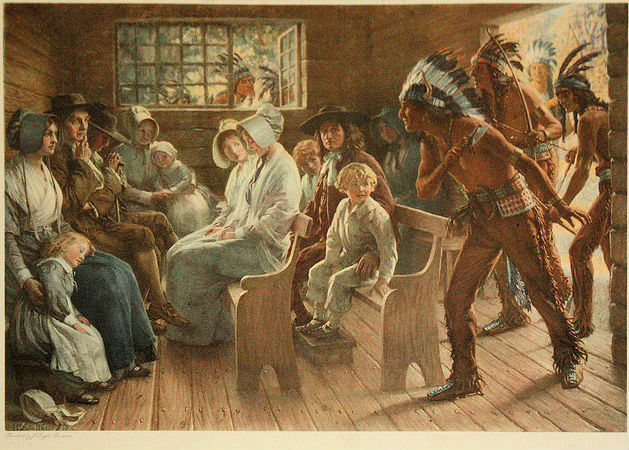 The pacifists remained in their homes, unarmed, when a group of Indians in Burgoyne’s army found them. According to the story, the Indians saw the unarmed worshipers and presented the group with a white feather as a signal of their non-aggression. The legend of the white feather is a story that has been passed down in the Quaker tradition for centuries. Start Track 22 immediately after Track 21 ends. An excerpt from the book: In Their Own Voices: Oral Accounts of Early Settlers in Washington County, New York by Jeanne Winston, recounting the murder of Jane McCrea.